Some of the best viewing days for gardens come along as the days cool down. This is when the shrubs, trees, and even the flowering plants are either at their full-blown best or at their stressed worst. Now is the time to look at what your garden can become. My favorite time to visit a botanical garden is in September and October. One of the best for fall viewing is the Riverbanks Botanical Garden in the South Carolina state capital, Columbia. 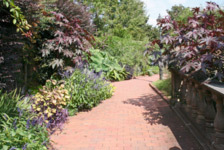 This garden is in conjunction with one of the best zoos in the country, Riverbanks Zoo. There are gardens throughout the zoo complex and in combination with the animal exhibits. The best garden experience is across the river in the Botanical Garden. Here is where you will see what mature plantings and color combinations look like. If you want to see what mature ornamental grasses look like, fall is the time to visit. In this time of year, you can see just how large that clump of Miscanthus will get. Although this photo shows several clumps of grass growing with the streetlight, you can just as easily position one clump near your light to get the same beautiful effect. Botanical gardens have more room, so take clips and snips of the overall effect to use in your own garden. Other beautiful plants in the fall are the burgundy castor beans, seen here. They give a lush, tropical effect to any sunny garden. These huge plants are easily grown from seed every year. But beware! These plants are highly poisonous to humans and pets. Even though castor bean plants hold their seedpods high up, they are not the only poisonous part. The leaves and stems are also poisonous. They do serve a purpose more than being ornamental, though. If you have a mole or vole problem, castor bean plants will force these critters out of the garden. Their roots ooze a substance that irritates the critters skin and forces them to move to your neighbor’s garden. If you have plant-eating pets or children, leave these lovelies out of your garden landscape. Tropical plants look at their very best after the heat and humidity of summer. This is when they truly thrive. The black-leaved elephant ear (Alocasia macrorrhiza) and banana plant (Ensete ventricosum 'Maurelii') shown here are at their tropical peak of color and form in the fall garden. It will be some weeks before they are shut down with frost. Then, if you live in a USDA Zone below 8, you can dig them up and move them to a frost-free, cool area to overwinter. When you are strolling gardens, whether your own or a botanical garden, pay special attention to the way patterns and shapes add interest to a scene. Here at the entrance to the Riverbanks Botanical Garden, notice how a flat expanse of concrete is broken up by the use of boulders, small trees, and container plants. Notice, too, the differing forms of leaves that are within view along with the curve of the planting beds. There is not a lot of different plant material used here, but the sweeps make them interesting and the overall view is pleasing. Take home some inspiration from a botanical garden near you.